Cruizers for Christ has organized a car, truck and motorcycle show benefit for Austin Owens, 9, of Sidney, who is battling a genetic disorder known as AdrenoLeukoDystrophy (ALD). The benefit will be held from 9 a.m. to 4 p.m. June 20, at Gover Harley-Davidson, 1501 E. Ash St., Piqua. Shown above are Scott Owens, with son Austin, Austin’s stepmother Patty Owens and sister, Evelyn, 13. SIDNEY — Until Jan. 19, 2014, Austin Owens was a happy-go-lucky, 7-year-old youngster who enjoyed first grade at Northwood School competing in youth wrestling leagues in both Sidney and Lima. He characteristically teased his older siblings and went by the nickname “Biggins” due to his premature birth at Miami Valley Hospital, Dayton, where he remained for one month before coming home to Sidney. Austin’s active lifestyle came to a complete halt nearly one and one-half years ago, when he was competing in a youth wrestling tournament at Stebbins High School in Dayton, and his father, Scott, a coach for Lima Central Catholic, was summoned to his side. Austin appeared to be lying on a gym mat experiencing a full body seizure and vomiting. His right leg shaking, Austin pleaded to his father to “make it stop.” A team physician checked his vitals and medics arrived after a call was made to 911. 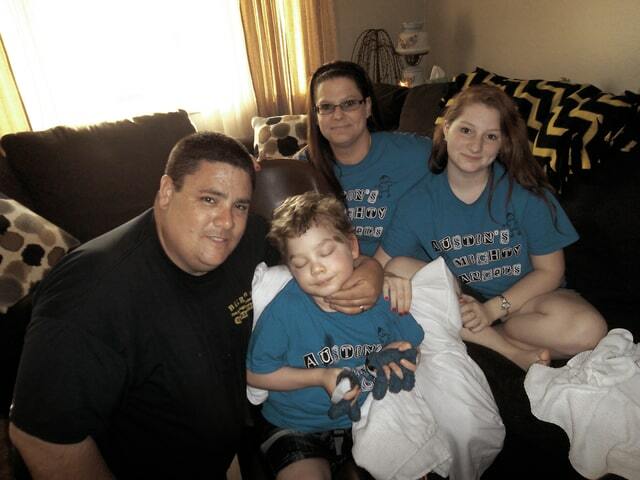 In what felt like an eternity to Scott, his wife, Patty, and Scott’s biological mother, Trish (Napier) Owens, Austin arrived by ambulance at Children’s Hospital in Dayton where the 56-pound, blue-eyed, sandy-haired youngster was admitted after a CT scan detected a brain abnormality consistent with an MRI procedure the following morning. Other family members — including Scott’s father and sister — arrived shortly afterward and for the next three days stayed by Austin’s side as they awaited results. Fearing his son had brain cancer, Scott paced aimlessly up and down the hospital hallways “scared“ and “defensive.” It wasn’t until he was ushered into a room with five medical specialists — including a neurologist and geneticist — that Austin’s father and family were informed their son was diagnosed with a genetic disorder better known as AdrenoLeukoDystrophy (ALD). According to Austin’s stepmother “the disease is terminal and generally gives a young boy a life expectancy of 1-10 years.” The odds of Austin acquiring ALD, added his father, is one in 21,000 boys between the ages of five to 10 years. Austin was transferred to Cincinnati Children’s Hospital soon afterward and in the spring of 2014, was given 10 consecutive days of chemotherapy as well as a bone marrow transplant on April 15 “in hopes of putting the disease on pause.” During a recent interview, Patty, who was wearing a T-shirt which reads “Austin’s Mighty Angels,” indicated it’s been 386 days since her stepson “started counting toward a new life.” Unfortunately, following his hospitalization and interim stay at the Ronald McDonald House, it was discovered Austin had contracted a staph infection. As a consequence, “Austin no longer speaks, he lost his vision, hearing and is unable to sit up or walk.” All that remains is his sense of smell. “According to the doctors,” notes Patty, “Austin’s brain is trying to reboot, rewrite itself, but (with) no guarantees.” On Nov. 10, the Owens family brought Austin back to their three-bedroom ranch home in Sidney, where he receives daily nursing care and is fed pureed foods through a stomach tube. In addition, he is administered nine medications daily for pain, steroids, Vitamin D, sleep enhancers and other maladies. Coordinated by Cruizers for Christ, the show will begin with registration from 9-11 a.m. at a cost of $10 per person. Dash plaques will be distributed along with “awesome goody bags to the first 50 entries” and also include participant judging, a driver’s pot, and Top 30 trophies sponsored by Helman Brothers Body Shop. Awards will be given at 3 p.m. There will also be a 50/50 drawing, food door prizes, a silent auction, crafts, a bake sale, music by Hard Times and presentation of Austin’s Choice Trophy. And, according to Scott Owens, his son will be present for the show with 100 percent of the proceeds earmarked for Austin L. Owens. For more information, contact Charles and Rose Ann Chaffins at (937) -492-3203.